Bianca and I have been best buds since the rip old age of 14. I've talked about her loads in this ol blog, making an escape to her beautiful home of Coronado, San Diego whenever I have the chance. I'm still in utter disbelief that in less than a week, I'll be making my next trip to San Diego to watch Bianca marry her wonderful fiance Bobby. I'll be standing right up beside her, probably ugly crying my eyes out. (Is it proper to warn the photog to just go ahead and crop you you out of all the shots that involve vow giving, first kisses, I do's, etc...?). Back in April, our girlfriend Merri and I plotted and planned our little hearts out to throw Bianca the best Bridal Shower & Bachelorette weekend we could muster. The bridal shower she knew about, the bachelorette party she did not. Surprise bachelorettes are officially my favorite thing. 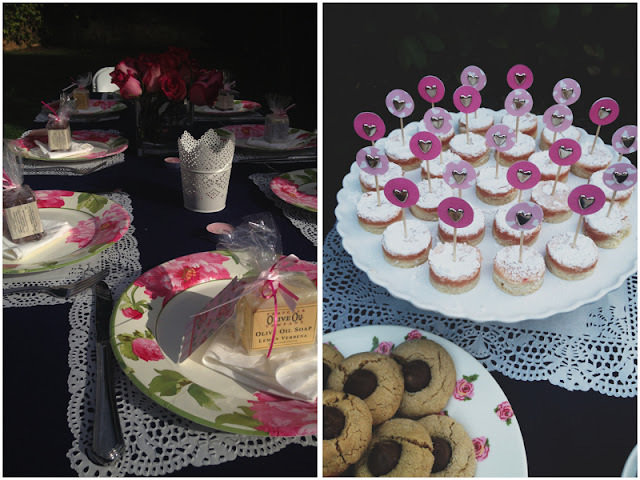 With the help of her future mother in law, and an army of friends and family, we turned her in law's backyard into a girly mecca with good eats and even better sweet treats. We showered her with love, presents to feather her nest, and whoooole bunch of champagne & cosmos. Because, obviously. Let the countdown begin! Prepare for some serious overgramming next weekend, friends. I am excited beyond belief.